Why Is Creationism So Disliked? All the more than 250 species of woodpeckers have tongues that stick out three times longer than their beak. The tongue reaches from their right nostril, around the outside of their skull, and into their mouths. At the end of the tongue are hard, saliva coated bristles and barbs that aid in grabbing the prey. The tongue can also be used for lapping sap. 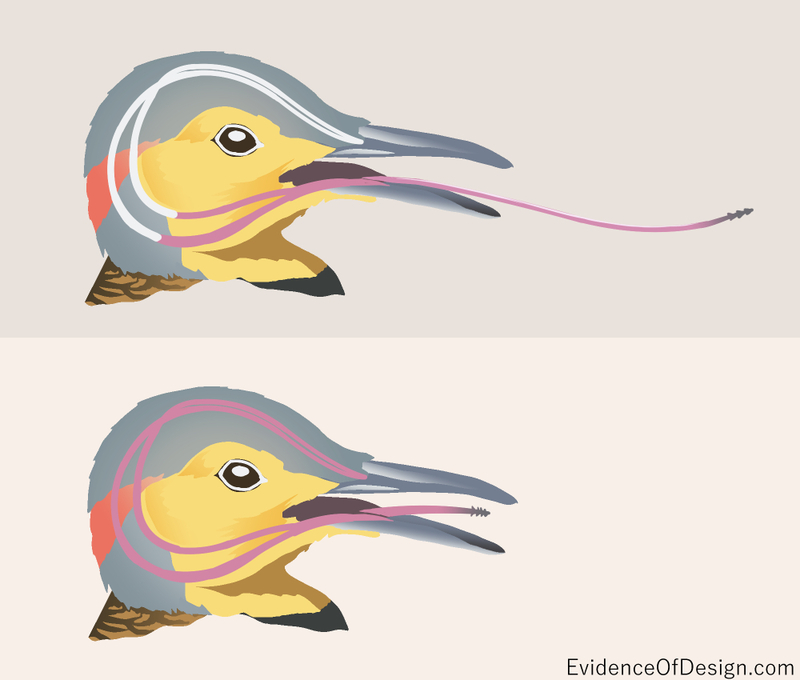 1) Why didn’t other insect-eating birds evolve such a tongue? 2) The tongue would do no good apart from the reversed toes for support. Did this evolve at the exact same time? 3) The tongue is not just long but is sticky and barbed. How did that come about? 4) The woodpecker uses the tail feathers for support. If they molted before new ones grew in, the bird would be greatly handicapped. However, the old ones grow in before the supporting tail feathers molt. Remarkable, eh? 5) To use his tongue in conjunction with his beak, the shock absorbing skull system, discussed last time, would need to be in place from the start. That makes three remarkable adaptations that all changed at the same time! 6) If the woodpecker’s head and tongue are the results of ‘accidents’ called mutations, how does this explain improvement? In writing this, I made many mistakes in typing and spelling. Not one was an improvement. Genetics works the same way. 7) The most telling problem is this: Though it is feasible that adaptations this major took place gradually (though hardly believable they all happened at once), the fossil record says otherwise. There is no fossil evidence that the woodpecker we know today was ever anything else. Not one intermediary form has been found. What is so repulsive about the idea that a wise Creator designed and made the woodpecker perfectly to do what he needs to do? Maybe this isn’t such an “erroneous claim” after all since such a view best fits the evidence and is in harmony with what the Bible says too. Of course, most mutations as well as typos are generally not for the better. You immediately backspace out any stupid typos and any stupid mutations cause the bird in question to just die in a similar manner. But genetic mutations occur over a mind-boggling lifespan – millions of years. In this time, an astonishing amount of mutations can occur. 10 million years is about the same thing as 140,000 of your lifespans. Imagine typing blog posts for 140,000 * 70 years. Of course, you’ll make a ridiculously absurd amount of typos – but every now and then, you’ll accidentally type something that is just awesome. You might type the wrong word and find it to be better than the one you wanted to use. While all the other typos are backspaced away, this one in particular stays around. Heck, you might even use that word again later in one of the blogposts. A similar thing happens with evolution. Only it’s not just you typing – it’s the population of millions of woodpeckers out there having a series of mutations over millions of years. While the failed mutations die, the working mutations are a benefit to the woodpecker and it sticks around to make even more woodpeckers. It’s kind of a wonder that we don’t have more insane and unpredictably awesome creatures, given how absolutely long they’ve had to develop. I mean, I used 10 million years as a conservative estimate – evolution for woodpeckers could have occurred over timespans as long as 300 million years ! Still, Sapincher, when you make the changes, no matter how long it takes, yes I’m sure you would come up with something awesome. But nothing upon nothing can be amazingly designed at all if no intelligence is there. It goes against science itself. The second law of thermodynamics says: all things are proceeding towards less order. Things are decaying. It is a fallen world that we are living in, because of man’s sin. the points made here provide no proof at all that evolution could not have occurred. in fact, all of these adaptations clearly show that all that were able to exist were those that evolved the correct adaptations in order to survive. creationism is ignorance, but if it makes you feel better to think that you have no control over your own life, well, ignorance is bliss.